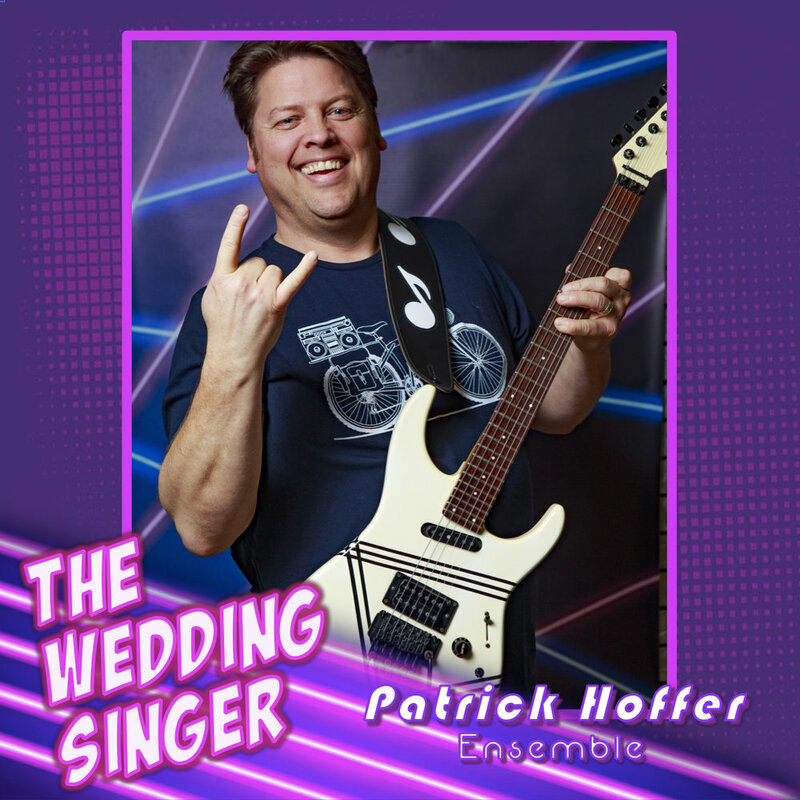 It's 1985, and rock star wannabe, Robbie Hart, is New Jersey's favorite wedding singer and the life of the party, until his own fiancée leaves him at the altar. 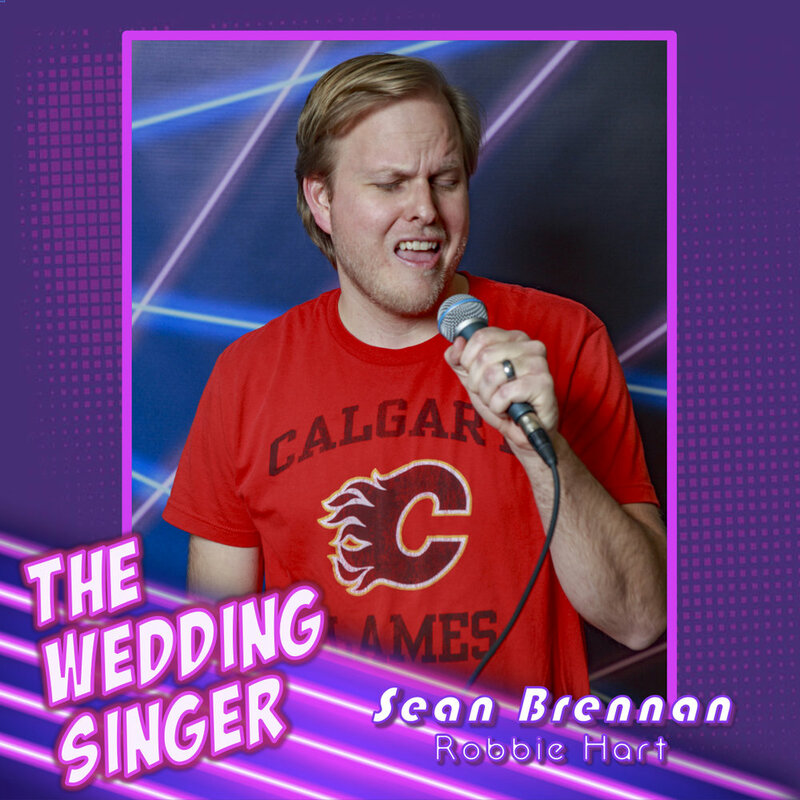 Shot through the heart, Robbie makes every wedding as disastrous as his own. Enter Julia, a winsome waitress who wins his affection. As luck would have it, Julia is about to be married to a Wall Street shark, and, unless Robbie can pull off the performance of a decade, the girl of his dreams will be gone forever. 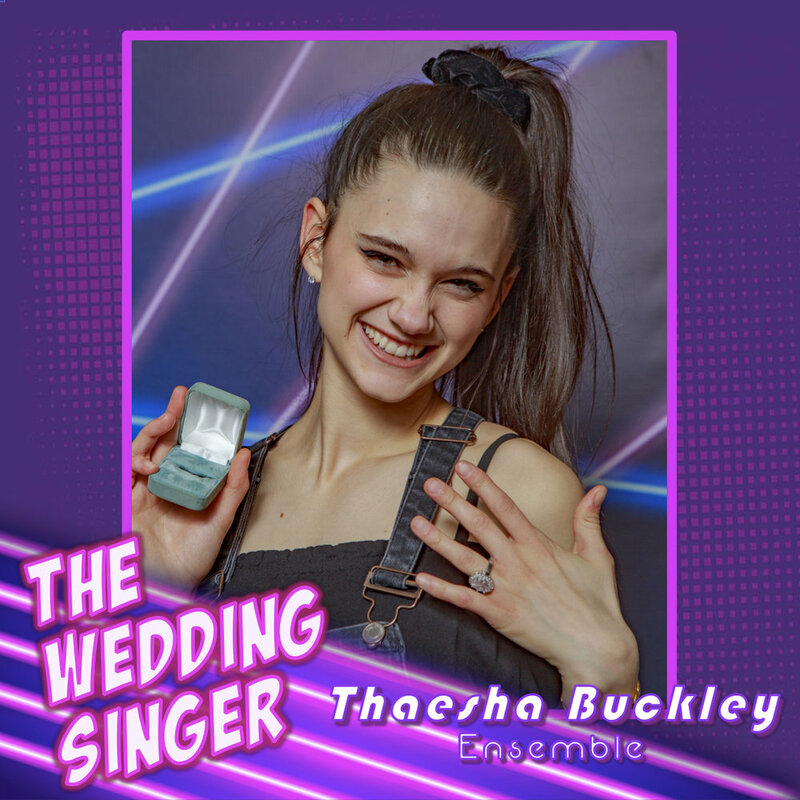 Featuring songs by the team behind the musical Elf, Matthew Sklar and Chad Beguelin, THE WEDDING SINGER received 5 Tony Award nominations including Best Musical and Best Original Score. Be sure to join Robbie Hart and his band when they come to the McManus Stage at the Grand Theatre February 1-9, 2019 as Musical Theatre Productions celebrates its 30th Anniversary Season. 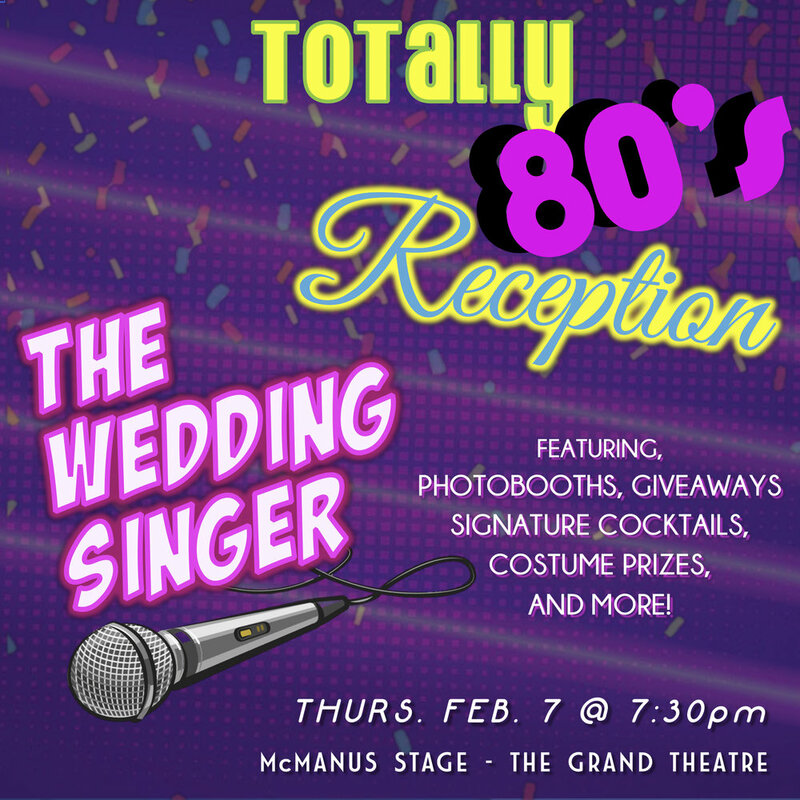 Join us on #ThrowbackThursday Feb. 7th for a Totally80sReception at THE WEDDING SINGER! Dress up in your finest 1980s formal wear! We want to see lots of poofy skirts, big hair and ruffly shirts! Prizes will be awarded to the best costume. Fight to catch the bouquet, try one of our signature cocktails, flirt with the best man, and win free giveaways! Plus don't forget to visit our photobooths to document all of the fun! 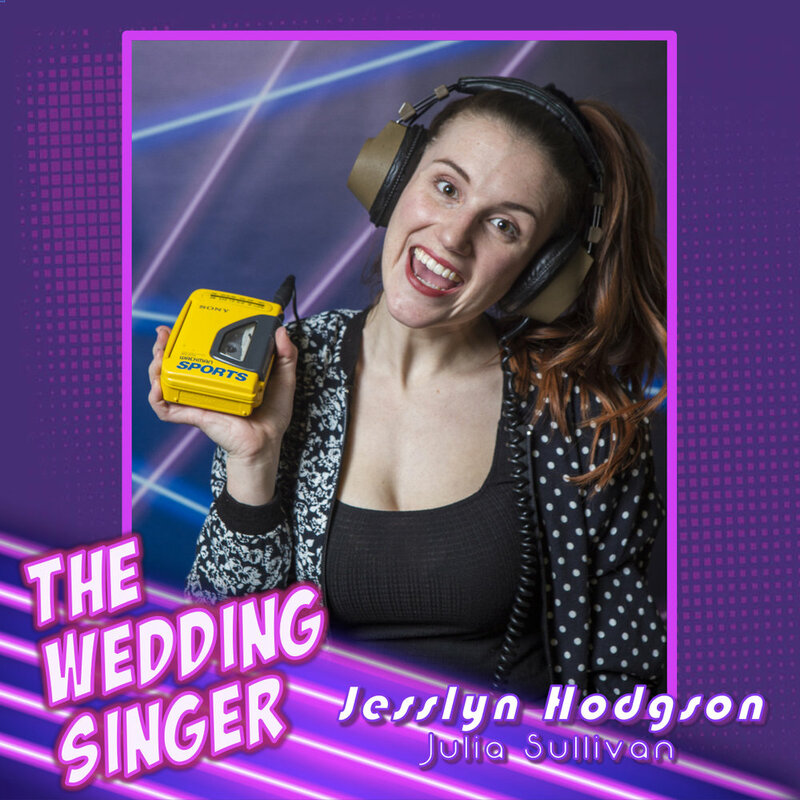 Jack 102.3 radio interview - Kerry Hishon and Sean Brennan drop by to talk 80's and the new MTP London show The Wedding Singer happening Feb 1-9 at the McManus Theatre! Photos by Ben McVittie Photography. Hover over photo for bios, and click for larger image. For MTP: Debut. Other Theatre: Beauty and the Beast (Cogsworth, London Community Players), A Creetin Christmas! (Freddy Stone, Banished By The King), The Seafarer (Sharky, Shrew’d Business), Trials of Robin Hood (Robin Hood, LCP), Treasure Island (Long John Silver, LCP), The Family Creetin! (Freddy Stone, Banished). Love to Cass who is strength and love and warmth and courage and who emulates and reflects her spirited and vibrant mom. Big hugs/kisses to Jack, Nora and #3! For MTP: Hello Dolly (Ermengarde), Defying Gravity: A Cabaret (Eponine), Heathers (Heather McNamara), Follies (Young Vanessa). Other Theatre: Dogfight (Marcy, Allswell Productions), Saucy Jack and the Space Vixens & Crooner Christmas (Link Theatre), A Creetin Christmas (Sybil, Banished Productions), Dancing in Poppies (Adelaide, London Community Players), Of Mice and Men (Curley’s Wife, By the Book). Jesslyn would like to thank her friends and family for their neverending support. Love to Connor for always running lines and Pippa for distracting her from doing so! For MTP: Seussical (Ensemble), Oklahoma (Slim), Zorba: A Musical (Pavli), Jesus Christ Superstar (Ensemble). Other theatre: As You Like It (Oliver, TheatreNemesis), Hair (Claude, Cat Scratch Theatre Company), The Tempest (Antonio, Western Theatre), Don Juan (Dr. Marphurius, Fanshawe Theatre). I am ecstatic to be a part of such an amazing cast and to be able to bring such a fun character to life! Where's the beef?!? For MTP: Oklahoma! (Ensemble). Other Theatre: Theory of Relativity (Vocal Director, Original Kids), FAME! 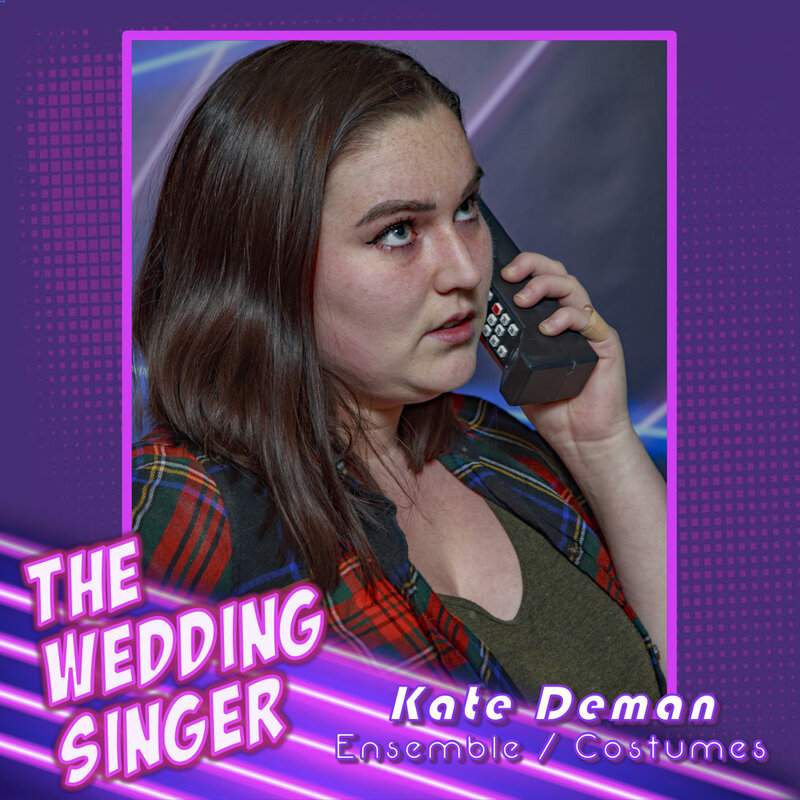 (Serena, Curtain Call Productions), Pirates of Penzance (Kate, Royal City Musical Productions), Jekyll and Hyde (Ensemble, Royal City Musical Productions), Joseph and the Amazing Technicolor Dreamcoat (Narrator, Notre Dame Productions). I am very excited to be a part of this very funny show. Love and thanks to my husband Chris and family/friends for their support! For MTP: The Light in the Piazza, Time Warp: 50 Years of the Rock Musical, [title of show], Jesus Christ Superstar, Bat Boy. Other Theatre: Mame (London Community Players), Rent (Royal City Musical Productions), Spelling Bee (JM Drama), Footloose (KW Musical Productions), Side Show (Confidential Musical Theatre Project). 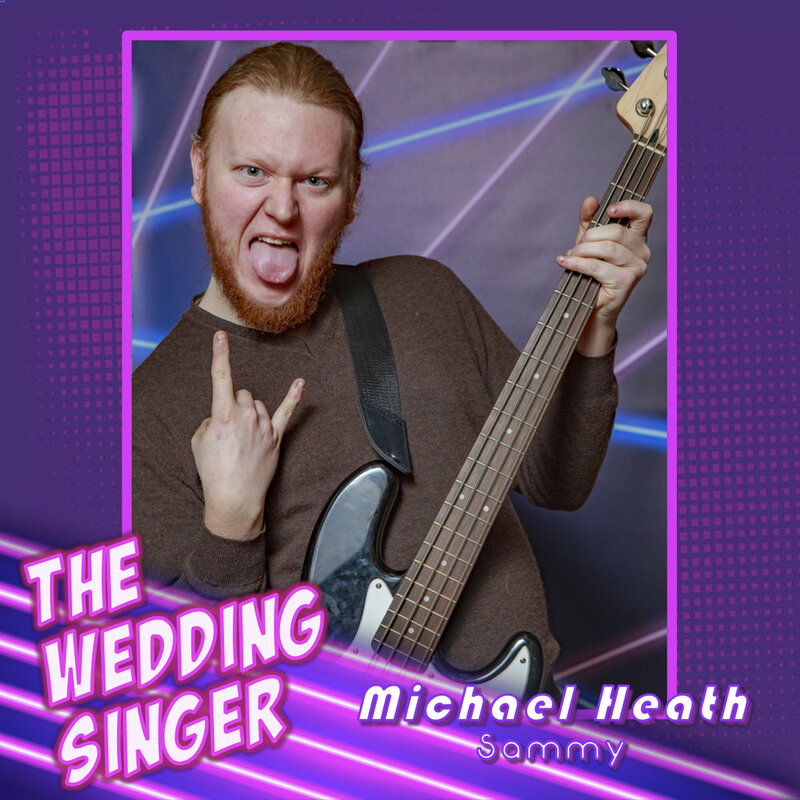 Henry is thrilled to be sharing the stage with this super chill cast, and to have another excuse to bust out his trusty old keytar, which is totally cool and normal to have, you guys. For MTP: The Mikado (Chorus), Iolanthe (Fairy), The Gondoliers (Nurse), Follies (Hattie), The Drowsy Chaperone (Housekeeper/Superintendent), Nunsense (Nun) Other Theatre: Harvest (Charlotte), Albertine in Five Times (Albertine at 60), The Secret Garden (Mrs. Medlock), All the King's Men (Various), Innocence Lost (Mrs. Truscott) for London Community Players. Mary Jane is thrilled to be able to rap in this musical. Thanks to friends and family who are so supportive of my theatre activities. For MTP: Hello, Dolly! Other Theatre: Becky’s New Car (Chris, London Community Players), Middletown (The Mechanic, Fanshawe College), Othello (Othello, Fanshawe College), The Tempest (Boatswain, Western Summer Shakespeare), The Glass Menagerie (Tom Wingfield, St. Mary’s Community Players), The History Boys (Rudge, Calithumpian), Titus Andronicus (Bassianus, Funeral Pyre Theatre), The Trials of Robin Hood (Lovelorn Robin Hood, London Community Players). Ethan is very proud to continue his acting adventures with his second straight show with MTP. Thanks to family and friends for the love and support. For MTP: Bat Boy (Mrs. Taylor), Songs for a New World, [title of show] (Heidi) Other Theatre: Fun Home - Canadian Premiere (Alison, Calithumpian), Urinetown (Pennywise, Curtain Call Productions), Night of the Living Dead (Helen, Iglesia Productions. Upcoming: The Who’s Tommy (Mrs. Walker, Pacheco Theatre). Excited to be a part of this HILARIOUS show with such a talented group of people. Big thanks to friends and family. Shout out: Aaron, Gina, and Andrew (MD). For MTP: [title of show] (Music Director/Mary), Bat Boy (Mayor Maggie) Other theatre: Heathers: High School Edition and Beauty & the Beast (Music Director, Original Kids), Dog Sees God (Producer), Legally Blonde, and Saucy Jack & the Space Vixens (Music Director, Simply Theatre), Bedtime Stories (Rumpelstiltskin’s Queen, The Voices Collective). Jenn’s 80s streak continues with Original Kids’ Rock of Ages: High School Edition in May 2019. Love and thanks to Craig, Sophie, Olivia and Ben. For MTP: Seussical, Bat Boy, Songs For A New World, Time Warp: 50 Years of The Rock Musical (Cast), Heathers (Director). Other Theatre: Much Ado About Nothing (Aerie Theatre), Legally Blonde, The Rocky Horror Show (Simply Theatre), Mr. Burns: A Post-Electric Play (Wortley Repertory Theatre), La Fille Du Regiment (Fountainhead Theatre), A Midsummer Night's Dream, Dracula, The Strange Case Of Dr. Jekyll and Mr. Hyde (Funeral Pyre Theatre), The History Boys (Calithumpian), The Tempest (Western Summer Shakespeare). Upcoming: The Who's Tommy (Pacheco Theatre). Thanks to @scottydubb88 and Whistling Dicks for the rad 80s ‘do and to mon petit ouiseau for supporting my dreams. For MTP: Lovelash (Debbie), Time Warp: 50 Years of the Rock Musical, Disney’s The Little Mermaid (Ensemble), Defying Gravity. Other Theatre: Disney Heroes & Villains (AK Arts Academy), Calum And The Whale (Tegan, London Fringe), Shrek The Musical (Teen Fiona and Brick Pig, Beal Musical Theatre), Riding Hood (Sister Hood, London Fringe). Thaesha is thrilled to be part of another MTP show, and to be working with such a wonderful cast and crew! A special shout-out to her family, boyfriend, and Kate Deman for all their love and support. For MTP: Lovelash (Nat), Time Warp: 50 Years of the Rock Musical (Ensemble / Costume Design), Disney’s The Little Mermaid (Aquata, Ariel u/s), Defying Gravity, Jesus Christ Superstar, Songs for a New World, Bat Boy (Shelly), Seussical, White Christmas. Other Theatre: Dogfight (Rose, Allswell Productions), Anne of Green Gables (Diana, London Community Players), Rent (Costume Design, Original Kids Alumni), Evil Dead (Shelley, Iglesias Productions), Little Shop of Horrors (Audrey, Iglesias Productions), Rent (Maureen, Vauxpunk). Kate would like to thank Adam, Ian and her friends and family for all the support. For MTP: Time Warp: 50 Years of the Rock Musical, The Little Mermaid (Carlotta, Ursula u/s). Other Theatre: Disney Heroes & Villains (Producer, AK Arts Academy), The Rocky Horror Show (Usherette, Pacheco Theatre). Upcoming: The Hunchback of Notre Dame (Producer, AK Arts Academy). I'm so excited to bring crimped hair and blue eyeshadow into 2019. Thank you artistic team for teaching me how to tango and for bringing this show to life! For MTP: Debut. This is my first experience in musical theatre. I want to thank Annie, Ryan and Erin and my awesome family and friends for their unbelievable support and encouragement. I also want to thank this incredible cast who made me feel part of this production from the very first rehearsal. And as always, God bless Whiskey Soaked Beavers. For MTP: Debut. Other Theatre: Beauty and the Beast (London Community Players) Thanks to my friends and coworkers for all your support and making this opportunity possible for me! For MTP: Debut. Other Theatre: Middletown (Fanshawe College), Othello (Fanshawe College), Legally Blonde (White Pines Onstage), Hello Dolly! (The Sault Symphony Orchestra. Upcoming: Punch Up (The Peanut Gallery) and The Who’s Tommy (Pacheco Theatre). Recent Fanshawe Theatre Arts graduate from Sault Ste. Marie! Excited to be in my very first production with MTP! For MTP: Debut. Other Theatre: Peter and the Starcatcher (Lord Aster, SDCI). I’d like to thank my friends and family as well as Aretina for her love and support. For MTP: Hello Dolly (Ensemble), Lovelash (Oli), Disney’s The Little Mermaid (Ariel), Songs For a New World (Assistant Stage Manager), Oklahoma (Stage Manager) Other Theatre: The Rocky Horror Show (Pacheco Theatre), Oh What A Lovely War (London Community Players). 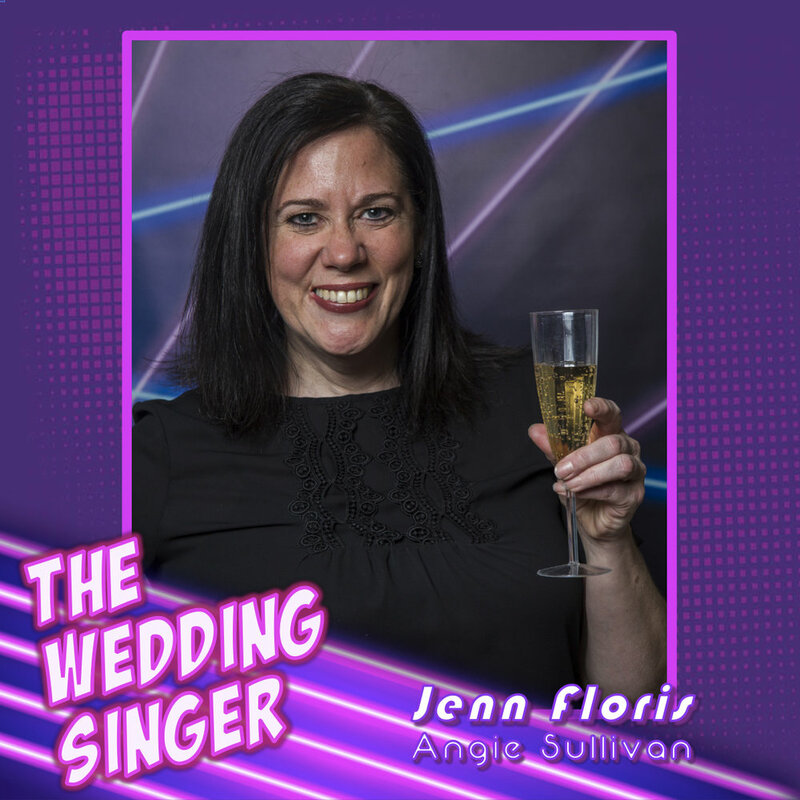 Steph has thoroughly enjoyed this trip to the 80s and would like to thank the cast and crew of The Wedding Singer for such an awesome experience! For MTP: Debut. Other Theatre: Shut the Front Door Improv 2012-2016 Special thanks to my children, Luc and Simone, for inspiring me to always do my best, and to the London improv community for teaching me to say YES to new and exciting opportunities. For MTP: Debut. Other Theatre: Twelfth Night (Ensemble) & Arcadia (Lady Chloe, London Community Players); New Canadian Kid (Mencha, Western Faculty of Education); High School Musical (Ensemble, Windsor Theatre Alive). Hannah is a secondary music teacher at College Avenue S.S. in Woodstock. She is director of the CASS Singers and CASS Spirit Band and is looking forward to directing a school production in 2020. It has been a pleasure working with such an amazing and talented cast and crew! For MTP: Debut. Other Theatre: Beauty and the Beast (LCP), Dogfight (Allswell Productions), A Creetin Christmas (Banished by the King. Jayden is thrilled to be a part of this great musical based on a fond movie, especially when surrounded by such a talented and hard working team. Enjoy the show and remember: Don't you talk to Billy Idol that way! For MTP: Debut. Other Theatre: Ten November (Fanshawe College), Rent, Footloose, The Mikado, Aida (Original Kids). Upcoming: The Who’s Tommy (Pacheco Theatre). I just want to thank all of my friends and family for all of their love and support. For MTP: Debut. Other Theatre: Little Shop Of Horrors (Doo Wop Girl, SDCI), Peter and the Starcatcher (Boy/Peter Pan, SDCI). Aretina has an immense amount of love and passion for theatre and hopes to continue bringing shows to life for many years to come. Love and Thanks to friends and family for all their support. For MTP: Time Warp: 50 Years of the Rock Musical. 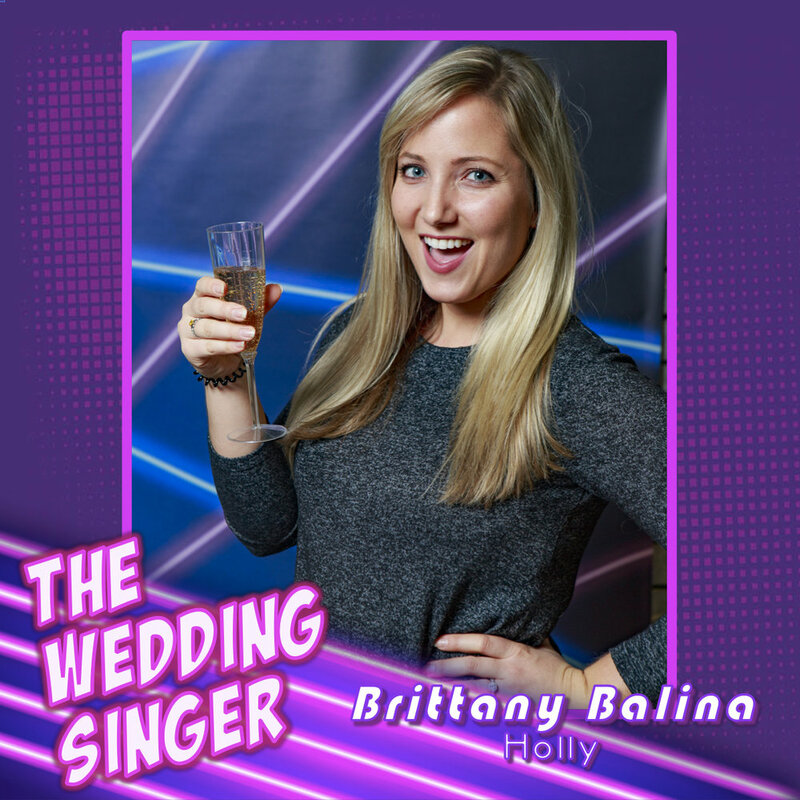 This is the first time that Brian has been in a full-length musical, so he is thrilled to be part of The Wedding Singer. Special thanks (as always) to my wife, Lauren, and my children, Emily and Michael, for their support (and patience) throughout! For MTP: Debut. Other Theatre: Beauty and the Beast (LCP), The Drowsy Chaperone, Dracula: the musical?, Grease (Theatre Woodstock), Big Fish, Mary Poppins, Anything Goes, The Hunchback of Notre Dame, The Princess Bride (Woodstock Collegiate Institute). Jacob would like to send a special shout out to all of his friends, family and mentors who helped him find his way and got him to where he is today. For MTP: Time Warp: 50 Years of the Rock Musical (Choreographer), Heathers (Fight Director). 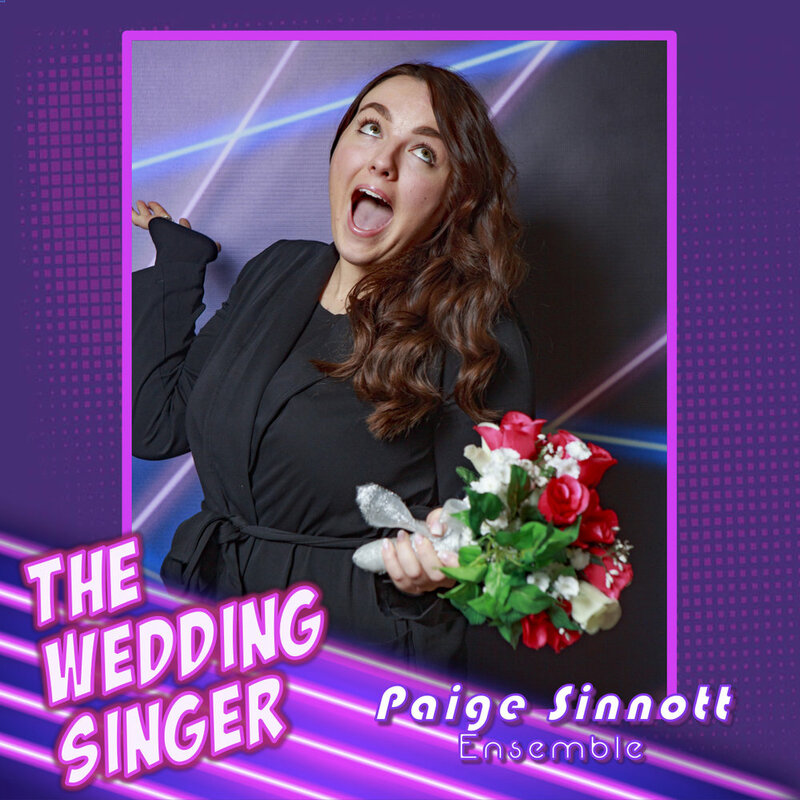 Other Theatre: Director of 15 shows with Original Kids including Heathers: High School Edition, Peter and the Starcatcher, Tarzan, and The Wedding Singer, as well as lots of stage combat with various companies in southwestern Ontario. Upcoming: The Enchanted Bookshop (LYTE Homeschool), Rock of Ages: High School Edition (Original Kids). I'm so happy to be bringing this hilarious musical back to life onstage with an incredible cast and crew. Love and thanks to Shawn. For MTP: Disney’s The Little Mermaid (Lighting Designer & Producer); Broadway to the Max, Dare to Dream (Producer); Hello, Dolly!, She Loves Me, Gypsy, Oklahoma!, The Drowsy Chaperone (Set Designer). Other Theatre: RENT, Sunday in the Park with George, School of Rock (Lighting Designer); Oliver!, August: Osage County, The Diary of Anne Frank (Set Designer). Upcoming: The Grunch (Director, Original Kids, Summer 2019) Joe is the Production Manager for Original Kids and is Past President of MTP. Special thanks to my partner in life and theatre, Andrew. For MTP: Show Off (upcoming), Disney’s The Little Mermaid (Director); The Light in the Piazza, Broadway to the Max, Night of Noir, Dare to Dream, Gypsy, Oklahoma!, Seussical, The Drowsy Chaperone, Follies (Musical Director); Jesus Christ Superstar, The Gondoliers (Cast), She Loves Me (Pit Orchestra). Other Theatre: 17 seasons at Original Kids as a director and musical director including Sunday in the Park with George, Avenue Q and Rent (alumni projects); Other local theatre and opera in London, Toronto, Edmonton, and Italy. Andrew has just completed his Doctor of Musical Arts degree in voice performance from Western University and teaches a small private voice studio. He has also been an MTP board member since 2014. Special thanks to my wonderful husband Joe for your constant support. For MTP: Debut. Other Theatre: Beauty and the Beast (Assistant Director/Choreographer, London Community Players), Way Out West in a Dress (Choreographer, Medway High School), Newsies, Heathers: High School Edition, Tarzan, The Wedding Singer, Singin' in the Rain (Choreographer, OKTC). Upcoming: Rock of Ages: High School Edition (Choreographer, Original Kids). I'm so excited to be choreographing this incredible musical with a wonderfully talented cast and crew! Love and thanks for the continued support from my friends and family! For MTP: Night of Noir (Director/Script Writer), [title of show] (Stage Manager), Jesus Christ Superstar (Stage Manager), Bat Boy (Assistant Stage Manager) Other Theatre: Vanya & Sonia & Masha & Spike (Director, London Community Players), Twelfth Night (Assistant Director, LCP), Someone Who'll Watch Over Me (Adam, LCP), The Normal Heart (Mickey, LCP), Dog Sees God: Confessions of a Teenage Blockhead (C.B., Simply Theatre). Jeremy would like to thank Kerry for the opportunity to work on this amazing show with such a wonderful group of people. Let's do it again sometime! For MTP: Hello Dolly (Assistant Stage Manager) Other Theatre: Twelfth Night (Assistant Stage Manager, London Community Players), Calum and the Whale, Midnight in Paris (London Fringe). Upcoming: Bio Writing 101. Thanks to everyone in the theatre community for the great opportunities and for everyone who supports local arts. For MTP: The Light in the Piazza, Disney’s The Little Mermaid, and Heathers the Musical. 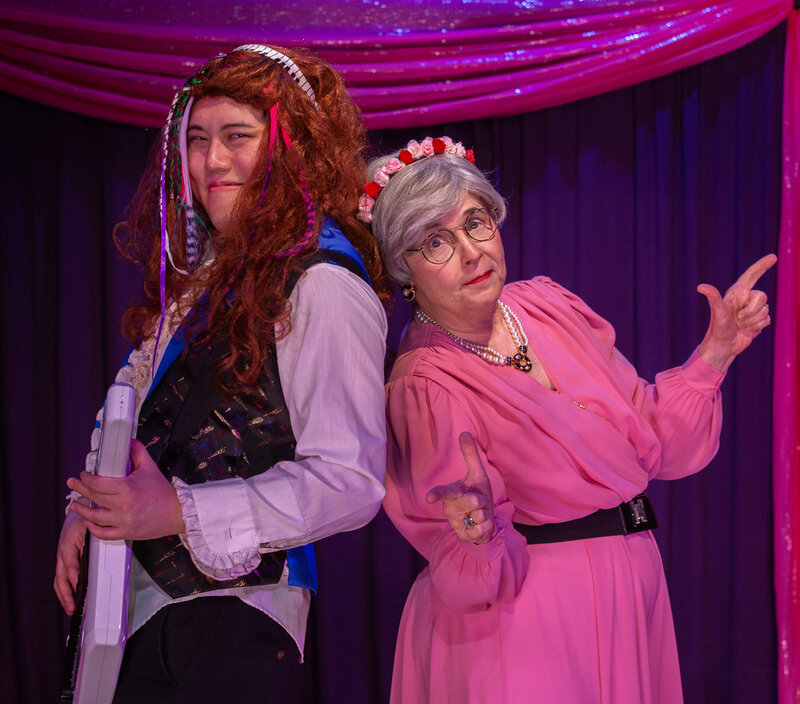 Other Theatre: Susannah (Peck Productions), RENT (OKTC Alumni), Red (Calithumpian Theatre Company), and Sunday in the Park with George (OKTC Alumni). Laura Sepulveda is a graduate of York University, and is currently the Technical Director at Original Kids Theatre Company. She is also the program coordinator for LDN Convergence at The Arts Project.